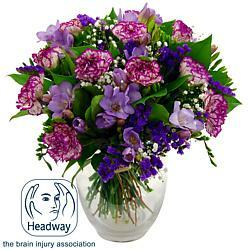 Lilac carnation in the following bouquets which are available for next day delivery in the UK. Carnations are most one of the most popular flowers around. They're versatile, remarkably durable, and they actually last longer when they are cut. It's a flower fiend's dream come true! Carnations are native to the Mediterranean region in Europe, or so we think — they've been grown in captivity for so long now that it's hard to tell when their cultivation began! Carnations are said to express several traditional meanings. The main emotions associated with carnations are love, fascination, and distinction, though there are many variations dependent on the colour of the petals. The Carnation's formal name, dianthus, comes from Greek for 'heavenly flower', or the flower of Jove.